I recall a brief period in the early 2000’s when some pro riders would show up to dry weather endurance races wearing their road bike shoes. 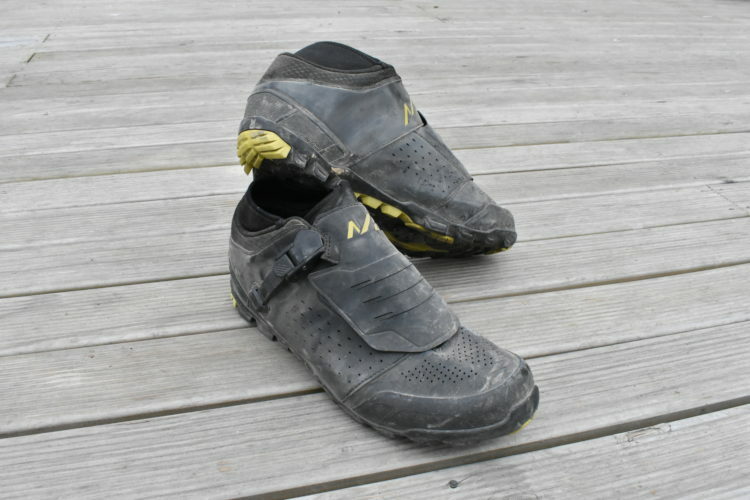 These were the lightest shoes available by a long shot, offered the best power transfer, and because talented riders were not getting their shoes dirty until the finish line, there was no need for bulky cleats. But times have changed, with gravity racing exploding in popularity and MTB shoe design taking a big leap forward. 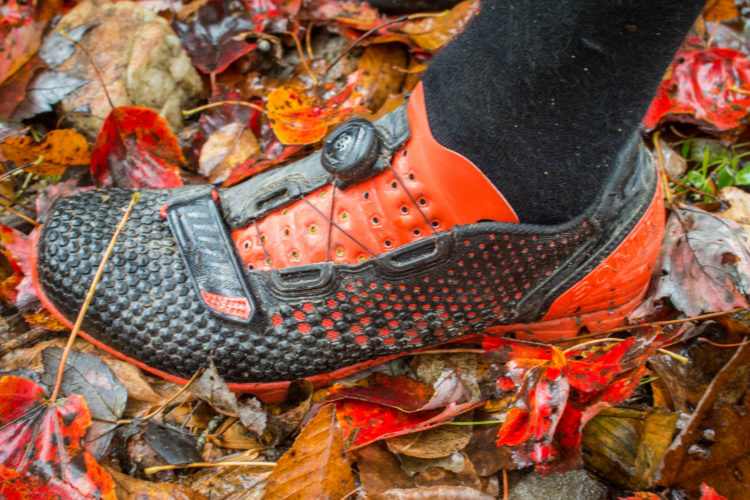 The new Shimano AM901 kicks are a prime example of a purpose-built MTB shoe, designed and marketed as a top shelf enduro/downhill SPD offering. 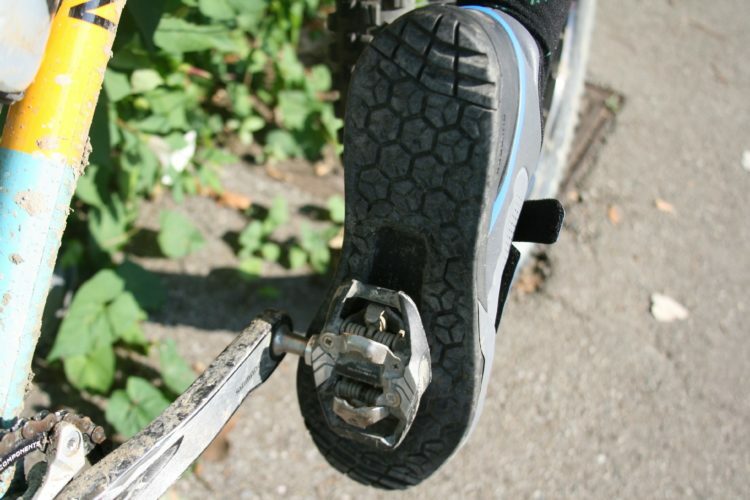 The patented cleat-channel provides concise cleat/pedal location when it counts, and gum-soft soles make for good traction on most pedals when clipping in isn’t an option. The topography of the sole is cut similarly to a modern skateboard tread, leaving little to interfere with pedal grip. 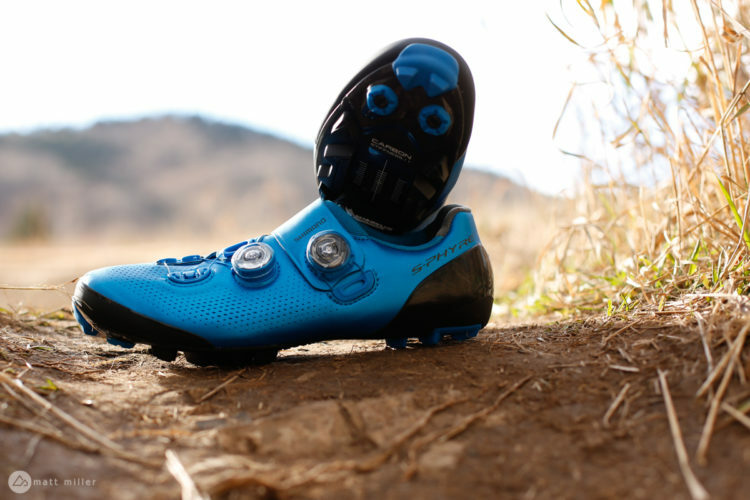 Shimano’s patented cleat-channel makes clipping in feel magnetized. 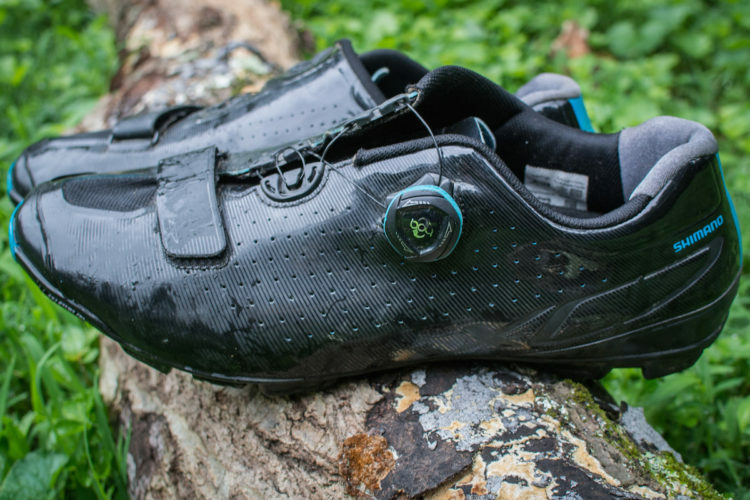 The shoe uppers are made of a synthetic leather that Shimano claims will absorb less water and dry faster than cowhide. The northern Italian spring is finally rolling over into summer and I don’t know that I’ll be submerging my feet any time soon, so I’ll save that for a follow-up report. The robust toecap is one of my personal favorite AM901 design elements. Nearly once per season, I take my shoes off to find that a stone has claimed another toenail, so I am stoked to see if this new design will prevent that issue. Additionally, the armored lace-shield provides a bit more protection from errant rocks and trail detritus, plus it makes for a clean look overall. Speaking of aesthetics, these are some of the best looking trail/enduro/DH kicks I have seen on the market. While they do clearly follow the design trend of bulkier modern skateboard shoes I don’t feel like I am wearing marshmallows on my feet. Shimano has done a solid job providing necessary amounts of protection without all the bulk that some of their competition favor. At a respectable 400g per shoe (size 42) I am excited to see how the Shimano AM901 shoes hold up after a few seasons of rocky shredding. Three adjustments to cinch them as tight as you like. Mounting the cleats took all of 5 minutes, including digging out my torque wrench and a bottle of blue Loctite. Several years back I noticed that one of my cleats had worked loose, only minutes from the start of a race. Since then I have applied a spot of blue magic to the bolts with every install. The cleat-channel on the AM901s is half as long as those on my other shoes, but still offers a sweet midfoot-to-toe adjustability range. I like my cleats behind the ball of my foot so my calves don’t explode when I drop my heels on a long descent, and I was able to get the cleat dialed into this position without a problem. I have long and very narrow pickaxes for feet, and at the outset, I was skeptical of the “speed lacing system” beneath the lace-shield. However, I was pleasantly surprised to find that the tug-lace tightened snugly around my foot, and left plenty of wiggle room in the toe box. The toe box is spacious enough that I feel some airflow while descending, keeping my feet less sweaty on a 90° June afternoon. With slender feet, I also have regular issues with my heels pulling free from shoes while sprinting or hiking, but I was able to get these tight enough to keep them firmly set. My partner testing her AM901’s at round 3 of the Superenduro series in Canazei. Shimano rates the AM901 sole stiffness at a 5 out of 10, and these are by far the softest-soled shoes I have ever ridden in. While testing I intentionally unclipped and stood right where I wanted on the pedals. My foot felt comfortably wrapped around the pedal and it stayed there. 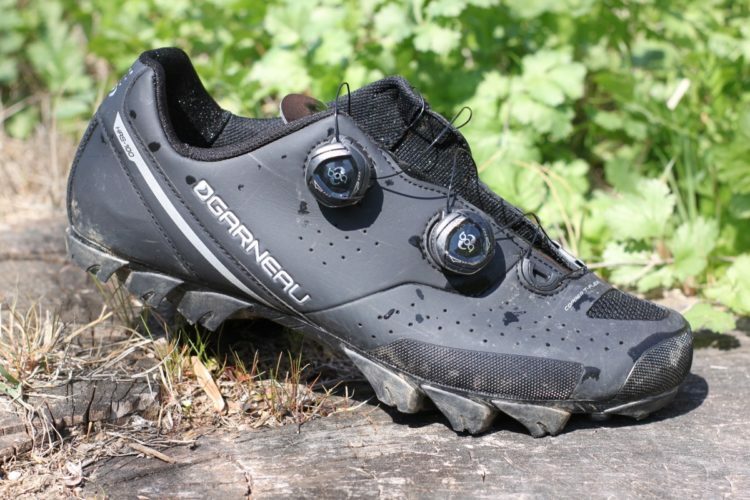 I tested these shoes with a pair of Shimano’s XT Trail pedals and had no trouble moving my foot around while clipped in. 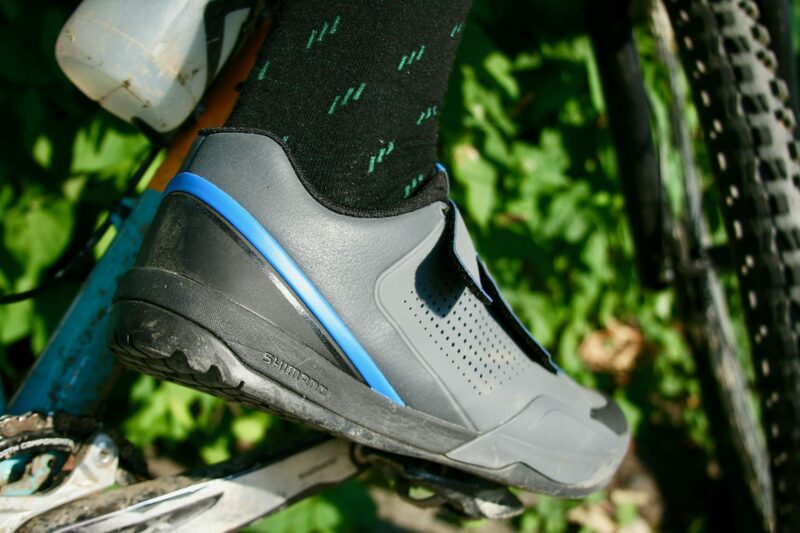 On the first few rides, I clipped out frequently on some of the steeper fall-line-to-berm transitions on my local tracks and was pleased to find that the soft soles did not slow down the disengagement process. Shimano checks all the boxes I have for a gravity-focused shoe with the AM901s. I was looking for something lighter weight and somewhat breathable, with very little tread to interfere with emergency foot placement, a soft sole for walking on rock faces and gluing to pedals, a tight fit, and a look that doesn’t make my foot look ready for a pillow fight. The Shimano AM901 shoes do all of that and more, and I am super impressed thus far. For muddy rides with hike-a-bike bits, or any ride over 4hrs, I will likely leave these at home in place of a stiffer option with more tread. For every other gravity party, I think I have found the right kicks to comfortably enjoy some turns and boost my touch-point confidence. With an MSRP of $158 (€142), this top-of-the-line pair is rather reasonable, particularly compared to any carbon soled offerings. Shimano does offer two more affordable models in the AM line, with the AM7 priced at $134 and the AM5 offered around $114. The AM901 comes in standard and wide sizing from 36-48. I wear a size 44 in Sidi and Giro, and the 44 fit me perfectly. 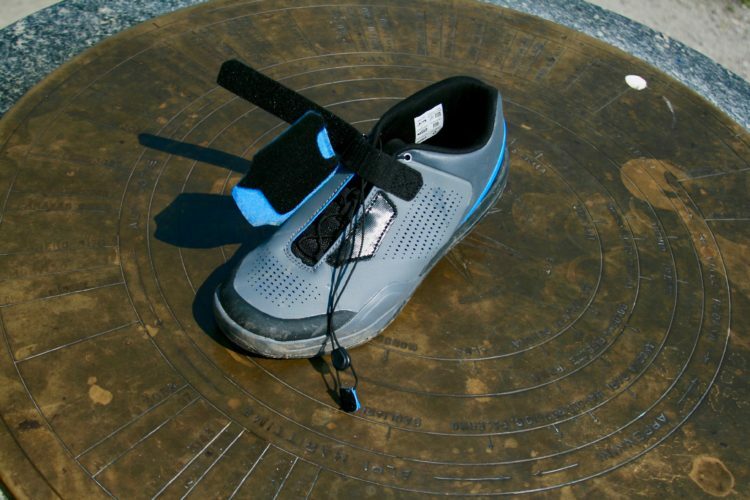 Shimano advertises these as men’s shoes, but with this size range, nearly anyone can sport these kicks. 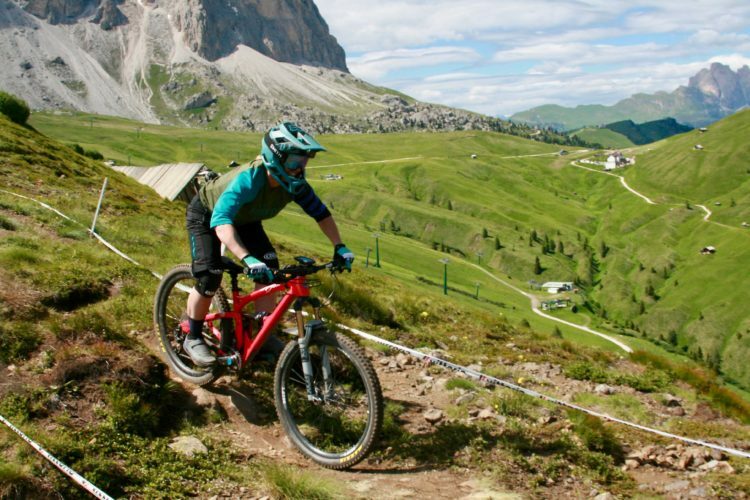 Three of my female riding partners concur and are loving theirs for racing and riding steep tracks in northern Italy.